LOGOPRESS Corp., Besancon, France, along with its North American distributor and technical center, Accurate Die Design, New Berlin, WI, has released Logopress3 2015 that now includes Logopress3 Nesting. Use the nesting module to develop the required sheet size for a nest, or to set the width, control part angle or flip parts upside down. Users also gain flexibility in setting clearances between parts, can establish individual part quantities, can opt to nest into openings and can generate reports. Nesting starts with either a multibody part file (created with SolidWorks or imported from a different CAD system) or with individual part files from an assembly. After setting some logical parameters that optimize flexibility, the module will quickly nest the parts per the options that the user sets. No formal training is necessary. 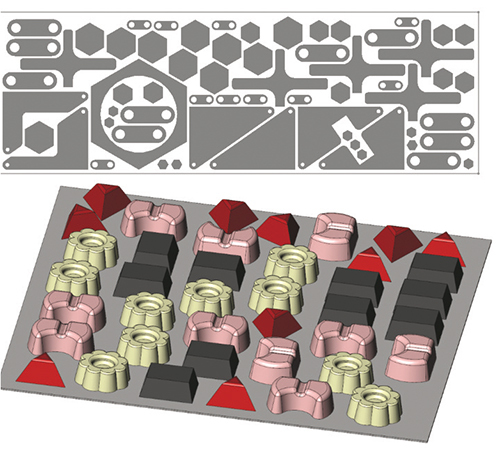 For a die designer, this module can prove useful when building wire-EDM burn blocks or for nesting various-shaped sharpening shims for under-die inserts.